What does EBMS do? EBMS is a third-party administrator of self-funded health benefit plans. EBMS works with employers to design and administer their health care management plans as well as provide a variety of services to help employers manage their health care such as onsite/near site health centers, wellness programs, disease management programs, medical management programs, pharmacy services, captive insurance risk services, flex, HSA and HRA administration and tools and information for employees and family members. Ultimately, EBMS’ goal is to reduce costs and improve care for its roughly 275 clients (which operate in a wide range of industries across the United States). What's the skinny on them? EBMS, founded in 1980, is often referred to as a pioneer in the industry and applauded for its innovation practices. It was recently announced that Water Street, a Chicago-based strategic investment firm focused solely on healthcare, will invest in expanding EBMS' suite of services, enhancing its technology and extending its national footprint. The financial terms of the deal have not been disclosed, but it is expected that Water Street, in addition to investing, will also provide strategic support. 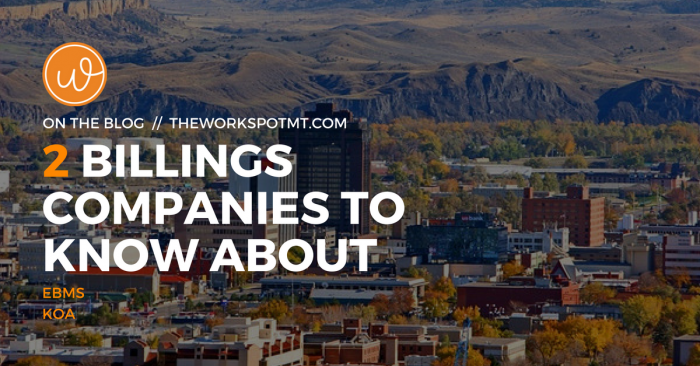 Oh, and we should also mention that this top Montana-based company is hiring (check out top Billings jobs available with them)! Watch this great video by MSU Billings on the impressive story of EBMS. You can also learn more about EBMS in recent press via Cision PR Newswire. What does KOA do? Kampgrounds of America (KOA) is the world's largest system of privately held and operated campgrounds with almost 500 locations across US and Canada, and they are headquartered right here in Montana! KOA is known for its easily identifiable yellow signs and the full suite of services and amenities you can find at its campgrounds - cabins, showers, swimming pools, coin-operated laundry, convenience stores and game rooms to name a few. KOA prides itself on offering the best of both worlds - easy access to the great outdoors with all the comforts and conveniences to take the ‘rough’ out of roughing it. Nearly all of KOA’s campgrounds are privately owned and operated. What's the skinny on them? In 1962, the World’s Fair was scheduled to be held in Seattle, Washington. Seeing an opportunity, Billings-based entrepreneur, Dave Drum, repurposed a parcel of land he owned near the Yellowstone River previously earmarked for a feedlot and built a new kind of campground. Drum anticipated a significant number of travelers would be passing through Montana on their way to the fair and could desire affordable but nice accommodations. It was this that spurred his thought for a campground to include hot showers, clean restrooms and a convenience store. The rest, as they say, is history. Today, KOA continues to innovate new amenities in its campgrounds, as well as ways to give back. One example is KOA Care Camps, where the mission is to allow children battling cancer to enjoy the joy, healing and freedom that comes from attending specialized summer camps where they can just be themselves. Other notable KOA programs include Kamp Green, Scout Camps and the Worker Kamper Program. KOA offers employment opportunities at both its corporate headquarters in Blllings, Montana, and across its various franchise locations. You can find current top job opportunities with its corporate office in Montana here. Interested in learning more about the wide range of amenities offered by KOA or about booking your next camping trip? Start here.